Parental Control Software | GET 3 Days Free Trial! If you have a computer at home, shielding your children from adult-oriented resources is difficult at best. Restrictions and enforcements are unrealistic due to the children’s curious nature. What can you do to protect your kids against the threats and shield them of the temptations offered by the modern Internet? Let us think for a moment what harm can the Internet do to the kids with no appropriate parental control. Inappropriate resources that are subject to parental control? Yes, including the obnoxious adult-oriented Web sites, but not limited to that. There are way too many harmful resources over the Internet that can confuse a young mind. Dangerous contacts? Certainly should be controlled by the concerned parents. The molesters out there are for real, and they can harm your kids even if they don’t meet in person if no appropriate parental control measures are applied timely. 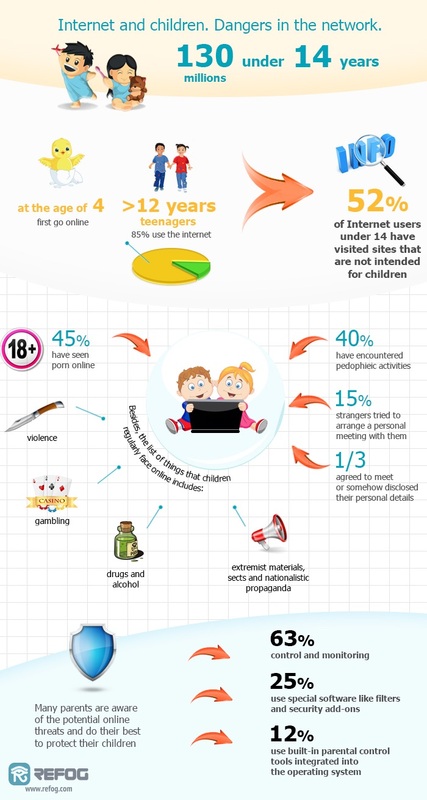 However, one thing that harms your children health more than the adult Web sites and possible molesters is the time they spend in front of the computer screen. Spending too much time with the computer affects vision, bearing and psychic health of your kids. And what can stop your kids from playing computer games all day long if not parental control? The solution? Total parental control is the only answer. Microsoft has introduced Parental Control in Windows long ago. Microsoft version of Parental Control allows setting Web and game restrictions, blocking specific programs and setting time limits. Using Windows Parental Control you can restrict the Web sites that your kids are allowed to visit. Parental Control allows you to filter or block inappropriate content and prevent file downloads altogether. With Windows Parental Control you can even control how much time your kids spend in front of a computer by setting explicit time limits that control the time when children are allowed to access the PC. Windows Parental Control can prevent children from accessing the PC during certain hours, terminating their access and blocking the PC if their time is up. What’s best, Windows Parental Control comes with Windows and is, essentially, free. Sounds good enough? Think again! While Windows Parental Control definitely allows you to control what Web sites your kids can visit from their PC, and even control how much time they spend in front of a monitor, you still can’t control what Web sites they visit, what programs they run, who they chat with and what the chats are about. Control what your kids do online with appropriate parental control software. Refog Personal Monitor lets you achieve desired levels of parental control simply and reliably. Refog Personal Monitor helps concerned parents restrict their children’s access to dangerous resources and prevent inappropriate contacts by monitoring the kids’ activities in real time and notifying parents if they are in danger. It is your and only your responsibility to watch the inexperienced children and stop them from getting in trouble. Refog Personal Monitor effectively intercepts keystrokes and mouse movements, showing you exactly what Web sites your kids visit and what they are chatting about. It makes periodic screen shots of the PC desktop to further illustrate your kids’ activities in front of the computer screen. Total parental control does not have to be difficult.